​The CENSUS' participation in Advancing Research and Scholarship Day (March 16, 2016, at Boston College) has been featured in the Spring 2016 issue of Boston College Magazine (see article "Life with Exabytes" by Tom Cooper) . See a related interview here (with research assistant Peter Klapes). Journal of Modern Greek Studies 12.2 (Oct. 1994): 279-281 (E.-L. Stavropoulou). As Peter Mackridge, Prof. Emeritus of Modern Greek at the University of Oxford, wrote (in his 1992 review): “…”Until its next edition, [the Census] will be an indispensible guide for all English-speaking teachers and students of modern Greek literature”. From the perspective of Greece, bibliographer Dimitris Daskalopoulos has referred to the Census as "[the record of] our fortune abroad". 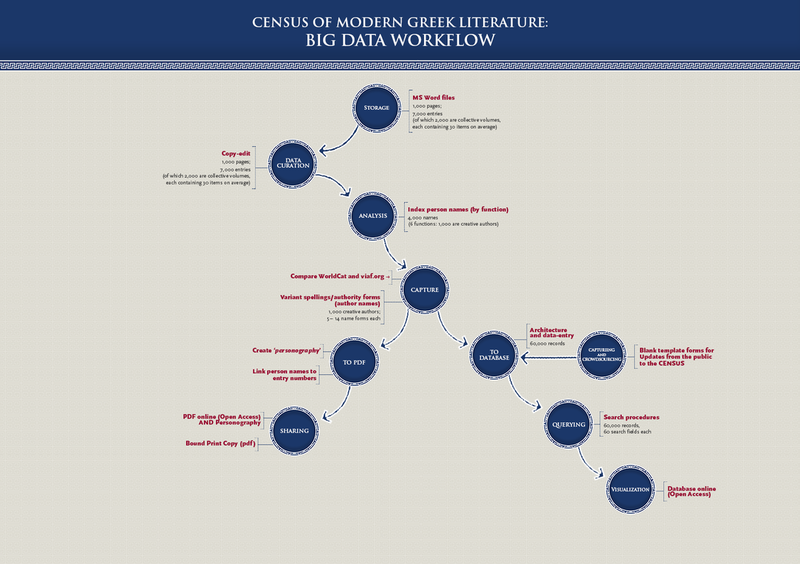 Related material from the CENSUS is now (2016) incorporated into the website of the Greek Language Center: http://www.greek-language.gr/greekLang/literature/bibliographies/from_greek/index.html. [Dia Philippides], "Ο υπολογιστής στις λεξικολογικές και βιβλιογραφικές εργασίες” (Computers in Textual Analysis and Bibliographic Compilations). In Το βιβλιογραφικό προσκήνιο στην Ελλάδα σήμερα: Πρακτικά Πρώτου Συνεδρίου Ελληνικής Βιβλιογραφίας (The Contemporary Bibliographic Forefront in Greece: Proceedings of the First International Conference on Greek Bibliography). Athens: Greek Literary and Historical Archive, 1990: 113-156.